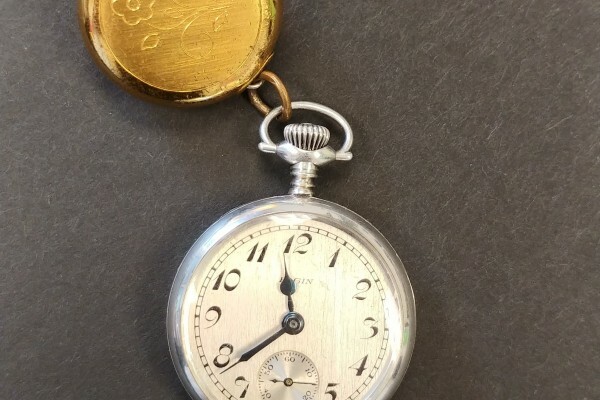 A small, pendant watch made in 1925 by the Elgin Watch Company recently arrived in the provincial archives, a gift from Richard Burda. The watch was originally a gift from Sr. Bertha Kedzieja, CSFN, to Mr. Burda’s father Eugene, who was a resident at the Sisters’ Holy Family Orphan Asylum in Emsworth, PA from August 1918 to September 1923. Only ten years old at the time, Eugene and his brother, Henry, 8, were placed at the orphanage by their father who was a coal miner from Portage, PA. Their mother had abandoned the family and their father was unable to care for the two boys by himself. “For my father, Sr. Bertha became an important, loving and supportive mother figure,” wrote Mr. Burda. Eugene and Sr. Bertha remained in contact long after both had left Emsworth, writing often to each other through the years. The last letter Eugene received was in 1990. Written by the superior at Nazarethville where Sr. Bertha resided, the letter explained that Sr. Bertha was in good health, though she was soon to turn 104. Born in Poland in April 1886, Sr. Bertha entered the Sisters of the Holy Family of Nazareth in August 1902 and professed her final vows in 1912. At the time of her death in 1990, Sr. Bertha had spent almost 88 years in religious life. A lifelong teacher in both the Chicago and Pittsburgh areas, she served in Emsworth, PA from 1922 to 1926. The watch is now on display in the Holy Family Province Heritage Room at the Provincialate in Des Plaines, IL. Eugene Burda passed away in 2000 at the age of 92.